The fluorometer measures turbidity and fluorescence, which can be used as a proxy for phytoplankton. The fluorometer will provide contextual data on biomass/productivity in the water column testing the hypothesis formed at the EMEC tidal energy sites that the advection of productive water masses into the area may signal the arrival/presences of many other species. Measures of turbidity/visibility can be used to predict the perceptual range of animals that may impact and predict the behaviour of species around the turbine. 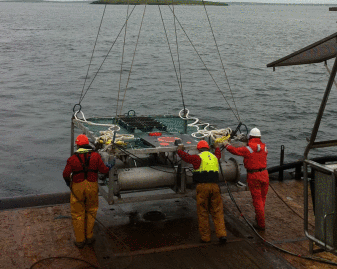 Pentland Firth Meygen AR1500 FLOWBEC Platform Fluorometer Data is located in United Kingdom.